Description: Amtrak 90 is on the point of the eastbound Pennsylvanian at Cove. Pa 4/2003. Description: East bound, passing the old, and long out of service, C&O bridge across the Kanawha River. Description: CSX P030, The Capital Limited, passes through Weverton heading to it's destination of Union Station in Washington. 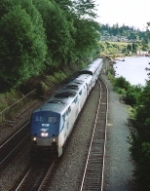 Description: Eastbound Amtrak Empire Builder rolls past Howarth Park. Description: Another view of the new signals at Virginia Drive, with another southbound Wilma deadhead. Description: Amtrak #11 (at left on main) meeting Amtrak #14 near south switch. Description: engine 90 hauls a nearly 4 hours late train 91 around acca wye and down onto the ACL where it will roar for florida. Description: Amtrak leaves Memphis station headed south in the early a.m. Description: Eastbound Amtrak Ann Rutledge crossing the Meramec River in Sherman Beach Park in Ballwin, MO. The train was running about 2 1/2 hours late when I took this photo. Description: Amtrak's Southbound Vermonter comes off the NECR and reverses to continue south to New York and DC.